If you’re interested in purchasing a new Genie garage door opener, please consider the options we have available. 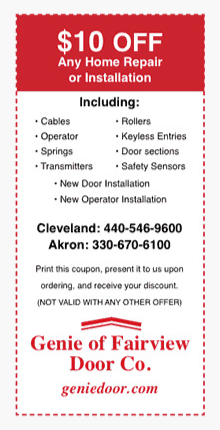 Most of our local customers in Cleveland, Akron and throughout suburban areas of Northeast Ohio will call us to schedule installation of a new Genie door opener. We are happy to schedule those installation appointments at your convenience and a partial payment is requested at that time. Some of our customers prefer to install their own Genie garage door opener. If you decide to purchase a professional model from our store and do your own installation, for pick-up purposes please keep in mind that our operators have durable, one-piece rails approximately 10 feet long. All of our Genie garage door openers come with deluxe transmitters that feature Intellicode Access Security System with rolling code technology that prevents thieves from entering the garage by duplicating access codes. Call today for pricing for any of our Genie garage door openers or professional installation packages. DC Motor – This strong DC Motor will operate properly balanced doors up to 10 foot high. The DC motor utilizes soft start and stop control to smoothly begin and end its cycle, causing less wear and tear. Quiet Operation – Our quietest system, it has an extremely quiet motor and belt drive requiring no lubrication, making it maintenance free. Battery Backup – It is battery backup compatible. The optional battery backup is easily attached to the back of the motor for a streamlined look, allowing you to operate your door whenever an area power failure occurs. Lighting – This smart looking unit uses 2 ( 60 watt) light bulbs with a light lens on either side of the motor head for ample lighting of the entire garage. We recommend using Genie LED compatible light bulbs. Engineered not to interfere with your radio controls and electronic circuitry. Compatibility – Compatible with all in-car Homelink® and Car2U® systems. Intellicode® – Intellicode® radio controls use a rolling code encryption technology that continuously uses a different code from billions of combinations. Diagnostics – Continuously monitors its operation, detecting significant changes in force, safely stopping its run. Wall Console – 3-Function wall console with a conveniently large operation button, vacation switch and light button for any time lighting of your garage. Infra-Red Sensors – Safety sensors uses invisible beam for no contact reverse of closing door when the beam is broken. Cord Length – Comes with a convenient 6 foot cord. Warranty: 15 Year Limited Motor Warranty, 15 Year Belt Warranty, 3 Year Parts Warranty. This Belt Drive Unit is incredibly smooth, quiet, and powerful! DC Motor – This heavy duty motor is equivalent to 3/4 horsepower, giving you enough power to handle any size residential garage door. Monitors Resistance – The circuitry constantly monitors resistance and adjusts accordingly. Two-Bulb Lighting System – Two 60 Watt bulbs add enough light to safely enter and exit your garage. Safe-T-Beam – For added safety, the Safe-T-Beam system stops and then reverses the direction of a closing garage door whenever the safety beam senses an obstruction in the garage door’s closing path. HomeLink Compatible – Links to a car’s built-in HomeLink remote system. Programming Easily Accessed – Located on the bottom of the motor unit for easy access. Back-Up Battery (Optional Accessory): A back-up battery is available as an optional add-on accessory for continued operation during power failures. One-Piece Rails: Comes with a one-piece rail for strength and durability. Rails also available for 8ft, 9ft, 10ft, and 12ft high doors. Warranty: 5 years on parts, 15 years on the belt, lifetime on the motor. A one year labor warranty covers our installation and any possible adjustments throughout the changing seasons. The Genie 1028 Belt Drive opener uses a DC, motor for a quiet, safe operation. DC Motor: providing quite, smooth, safe operation and is equivelant to the power of a 1/2 horsepower AC motor. Security: The Genie Intellicode radio controls are a rolling code system that changes code everytime it’s used, making it one of the safest, secure systems available. Warranty: 1 year on parts, 5 years on the motor. A one year labor warranty covers our installation and any possible adjustments throughout the changing seasons. Genie has completely redesigned the screw drive opener using a powerful Direct Drive motor equivalent to a little more than a 3/4 horsepower AC motor and a new channel rail system. Lifting Force: direct drive motor system gives more than a 3/4 hp system. Safety: the Safe-T-Beam package uses the newest technology for safety reverse without hitting anything. Warranty: 5 years on parts, lifetime on the motor. A one year labor warranty covers our installation and any possible adjustments throughout the changing seasons.